Beekeepers since 1890, Apidis has produced honeys for over 140 years. 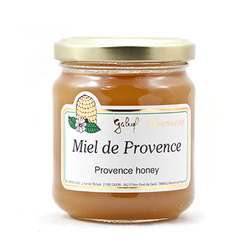 The Gabriel Perronneau’s Provence honey’s sources consist of both lavender and the forest. It possesses the same principal characteristics as the Lavender variety, reinforced by a more or less important note of forest honeydew. Used as a condiment, it seasons and personalizes your meals (meats, vinaigrette…) or your drinks (tea, cocktails…), thanks to its prestigious taste. Size (in): L 8.27" x W 5.71" x H 3.54"